Did the other 11 come up? The rest were all correct. 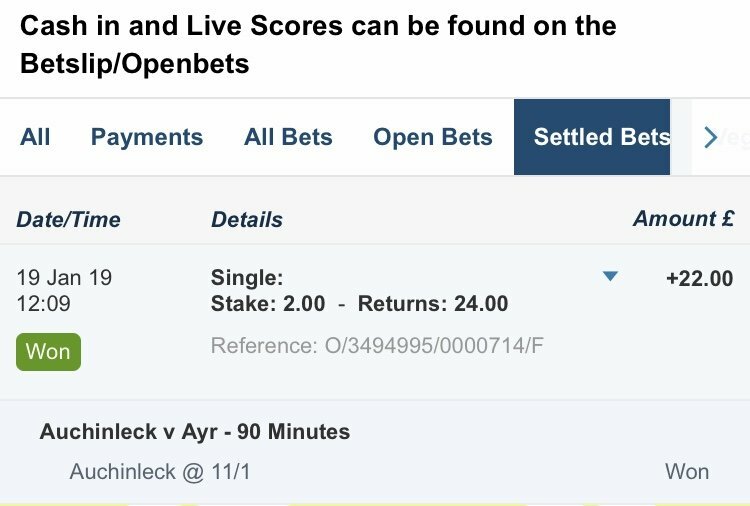 Killie are currently 13/2................games just started, think I'll watch for 20 mins and place a bet if they have a chance. Have you got money on Mallan scoring tonight Faraway? I only ask because I have and it is starting to look like a cursed bet! Nothing surprising, to most, here. Yeah, they (bookies) also try to "nudge" you towards daft (cough) bets throughout all sporting events on TV. The power of advertising will ensure some are swayed, I'm good enough at losing my own choices, thank you very much. You are absolutely correct and I would never encourage anyone to gamble. Over the two years I have had an online account, I have probably spent around £100. Not a huge sum, and for me, betting on the football is more of a fun hobby where I see it as spending money rather than trying to win. My stakes are generally £2 or £5, very seldom higher. I set a limit... how much am I prepared to spend this month on the football betting? That could be around £20. If the £20 is spent then the account stays at zero till the next month. Some people spend more on fags or booze, so I have no worries there. Re the odds, yup... I totally agree. I have recently changed how I bet. I generally put money on certain players to score if the odds are decent, or up to a treble of shorter odd match outcomes. I don't do correct scores... too much of a "gamble"! This month, I put £20 in my account. As of yesterday, it was worth £97.60. It was up at £101.... back down to £65... then back up to the current level. 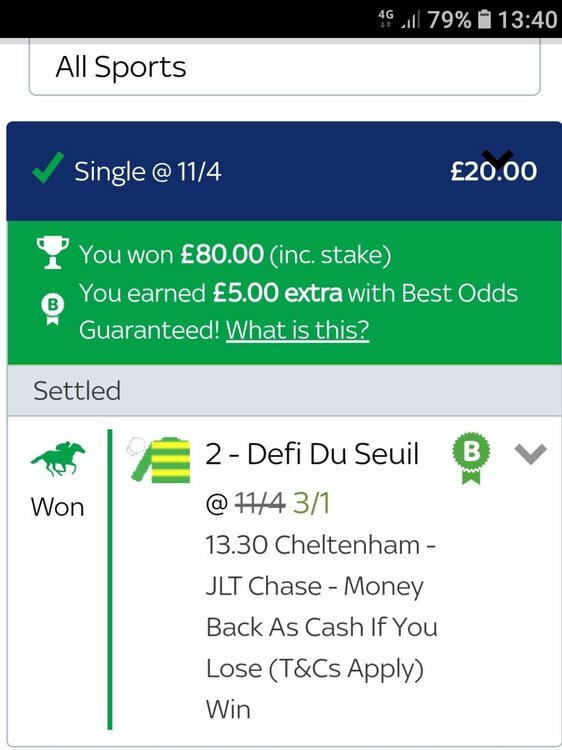 Both a gamble... both shortish odds... but combined, I got £43.75 back for my £5 stake. The other return was £2 on Simeon Jackson to score at 3/1 for an £8 return. Ayr v QoS and Morton v Alloa both draws (feckin Ton!!!) 5/2 and 13/5 would returned £37,50... but cost £5 instead. St Mirren 9/4, Hearts 6/5 and St Johnstone 3/4 for a treble.... Not even close!!! 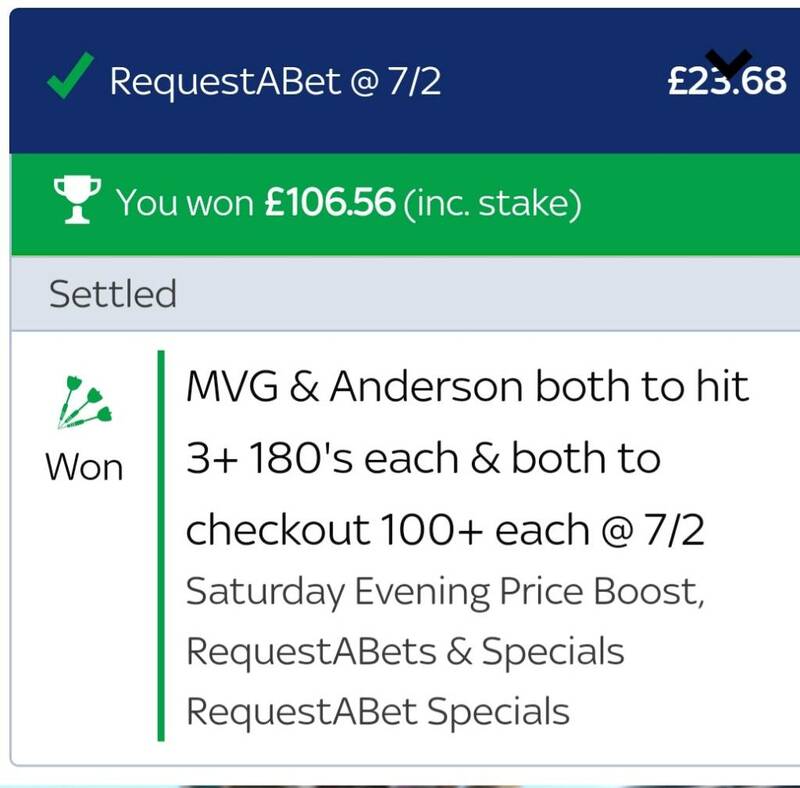 Would have returned £62.56... cost me £5 instead. Bottom line... bit of fun... interest in the football on a day when I had to work and couldn't attend... Net gain 34.75. I find that small stakes on doubles and trebles last longer and see it as a bit of fun. I fully expect my balance to be back to zero though! I don't bet looking to make my fortune... that is when it is, as my Mum used to say, "a mugs game". 5 match 50p accumulator with Bet365 to win £1439. Hibs v St Mirren - St Mirren to win (7-1) OH DEAR !!! You should have taken St Mirren to draw. Losing 2-0 at half time & down to 10 men. Kept the faith and put a wee wager on us to come back at 50/1! Makes me look pish. 10/1 at half time in a pretty even contest? I'd put on my 12 team accumulater but those Baaaaaastards cost me over £100 with my £2 stake. 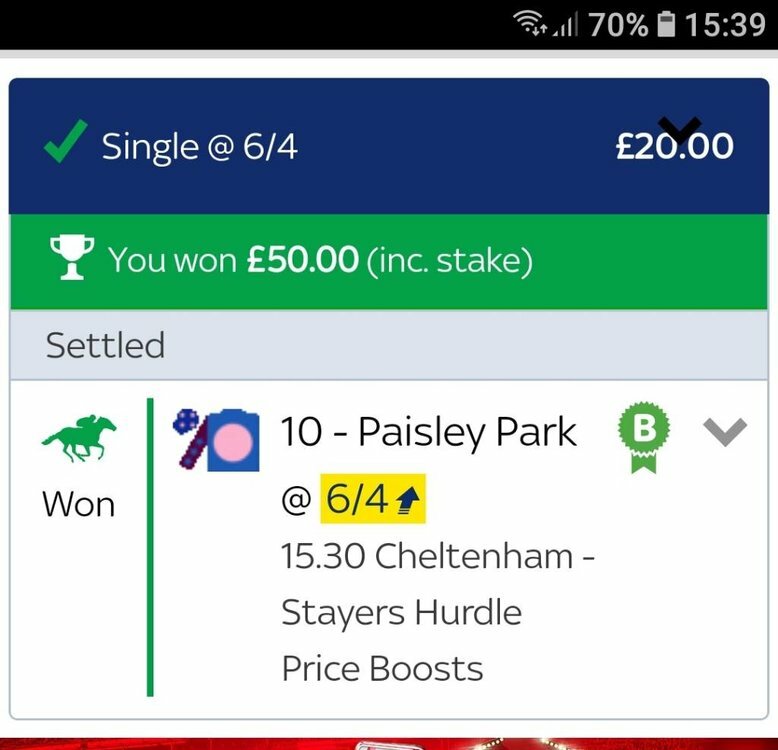 Paisley Park runs in the 3:30 Cheltenham today.Not great odds this time,6/4.I've stuck it on as part of a Lucky 15. Been good so far today, 2 bets 2 wins. 2 lines of 8 teams up with 5 mins to go.5 mins later?No lines up. 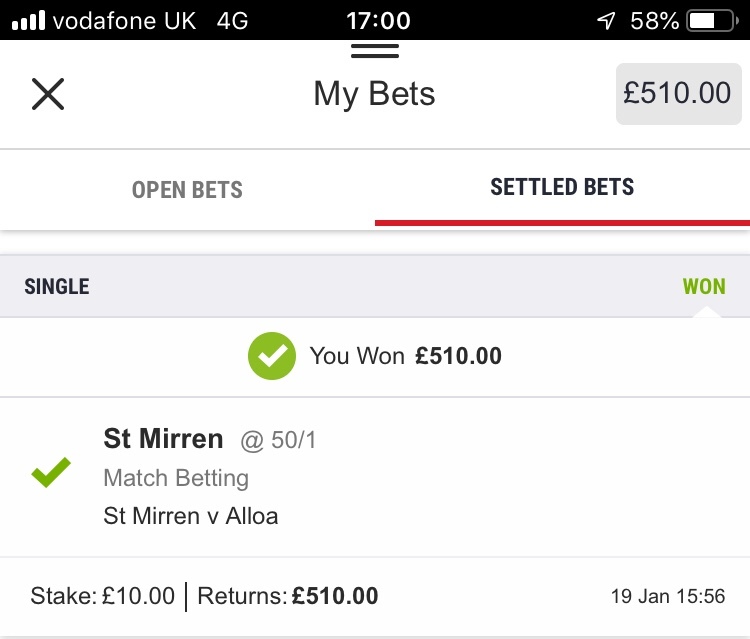 I've went BTTS and St Mirren win at 9/1.